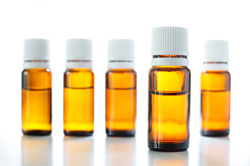 There are many different ABM extracts available on the market. One active component of ABM, glucans, is known to induce enhanced defense against viral and bacterial infections, as well as cancer. However, it is very important to point out that the commercially available ABM extracts are prepared by using different mushroom strains and in accordance to different protocols. It is well-known that generally mushrooms can change their shape and color (phenotype) and secreted substances according to which materials (substrate) they are grown upon. Also, different extracts of ABM are enriched with various additional components – that is why not all extracts of ABM exhibit similar properties. Extracts of Agaricus are prepared using various mushroom strains, diverse formulas and in accordance to different protocols; and therefore not all of them exhibit similar properties. Scientific studies compared the efficacy of the leading products available on the market, revealing extracts with the strongest anti-infection properties. 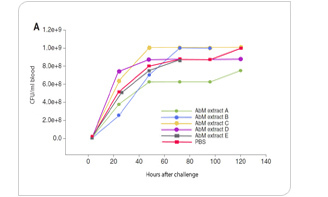 In order to evaluate antibacterial efficacy of ABM extracts, five ABM products described as A, B, C, D, E were compared blindly in a mouse model for deadly pneumococcal (gram positive) sepsis. The day, before the sepsis was induced, the mice received the extracts of ABM orally. One of the tested extracts, described as A, was a mixture of 82% ABM, 15% Hericium erinaceum (Japanese: Yamabushitake) and 3% Grifola frondosa (Maitake) - all of which belong to the Basidiomycetes mushroom family. This particular extract appeared to be the only one which had a significant protective effect. Extract A seemed to be the most efficient to reduce the number of bacteria in the blood of the infected mice. Moreover, the same extract significantly increased the survival rate of the animals. The high potency of extract A was described in yet another study, where the sepsis was developed by gram-negative bacteria. 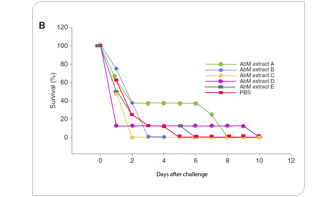 Mice were treated with the ABM extract the day before the induction of sepsis, and once again showed a decrease in bacteraemia, and an increase in survival rate. There was a great difference in effect on the deadly bacterial infection between the ABM extracts, presenting the superiority of extract A. This may be due to the presence of additional biological components and synergies with the two other Basidiomycetes mushrooms ingredients as well as the protocols for cultivation and processing methods. Extract A represents the AndoSan product, which appeared to be the only one that gave a significant protection in the overcome of deadly bacterial sepsis. Therefore, this particular mushroom extract was chosen for studies in other animal models and clinical studies, where it has proved to be beneficial. Hence, it is an obvious choice for illness prevention or treatment - and is widely recognized by the medical society.